Virtual reality has never looked better. 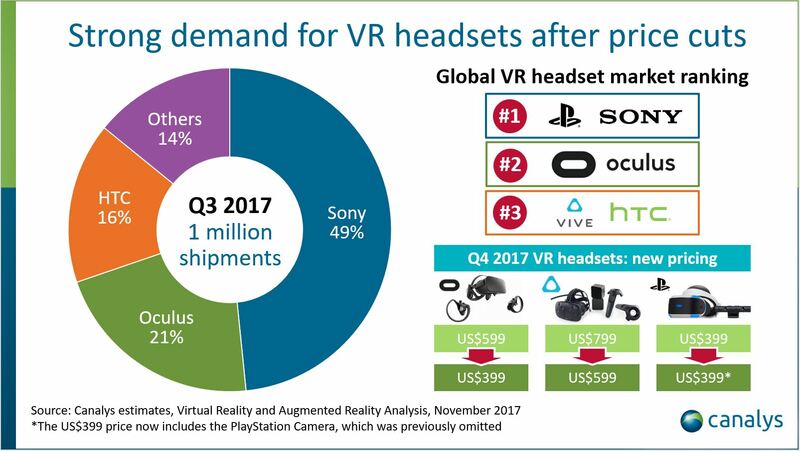 According to a new Canalys report, Q3 2017 was a record-breaking quarter for virtual reality headsets, with over one million shipments recorded. Canalys credits the price drop many VR headsets received last quarter as a big reason for the uptake. For example, the Oculus Rift, which is owned by Facebook, saw a price drop down to $399 USD, the lowest the headset has ever been. “VR adoption in the consumer segment is highly dependent on price, and Oculus’ strategy of lowering prices has definitely helped drive adoption,” said Vincent Thielke, a Canalys research analyst. And Oculus wasn’t the only company to lower its prices. Both Sony and HTC dropped the prices for PlayStation VR and the Vive respectively, and new headsets coming into the market such as Microsoft’s Windows Mixed Reality devices are entering at a similar or cheaper price point. To no one’s surprise, gaming continues to be the leading reason for picking up a VR device. Canalys considers a virtual reality headset as any device with a display designed to be worn on the face that immerses the viewer in a virtual world, including simpler devices such as Samsung Gear VR and Google Daydream. However, Sony, Oculus, and HTC have a significant hold on the market, as combined the three companies shipped 83 per cent of all shipments in Q3. Sony led the pack with 490,000 shipments, followed by Oculus and HTC at 210,00 and 160,000 respectively. Canalys predicts that this is just the beginning for VR, especially once Windows Mixed Reality headsets from Acer, Dell, HP Inc., Lenovo, and Samsung find a foothold. Amazon is also getting into the world of virtual reality, announcing this week Amazon Sumeria, a browser-based tool for building augmented reality and VR experiences.